The UkeBoutique and Ukulele School of Amsterdam celebrate 7 years this 2018 in Amsterdam, and have a new take on the international ukulele scene. Offering a year round ‘Ukulele Festival Vibe’ here at the UkeBoutique, we can now present Ukulele Lifestyle Retreats, & Group UkeShops. All events have been developed over the last 4 years for both the local and the international ukuleleclub.org members, artists, & arts teachers. Complete UkeStock Retreat or Absolute Beginnings Package. Add a special note to your Amsterdam holiday and register in advance up for a Ukulele LifeStyle Retreat. A complete, pre-paid / non refundable / non-transferable retreat package of €175 per person will include your choice of a 2 hour artist Masterclass, alternative “Showaround” cultural tour, or a ‘Ukulele Beginnings’ starter ukulele outfit valued at €50. You are invited to take advantage of up to 20 hours of group sessions per week with online advance priority reservations for the length of your stay. Included is a copy of the UkeStock Retreat Companion and sheet music guide. 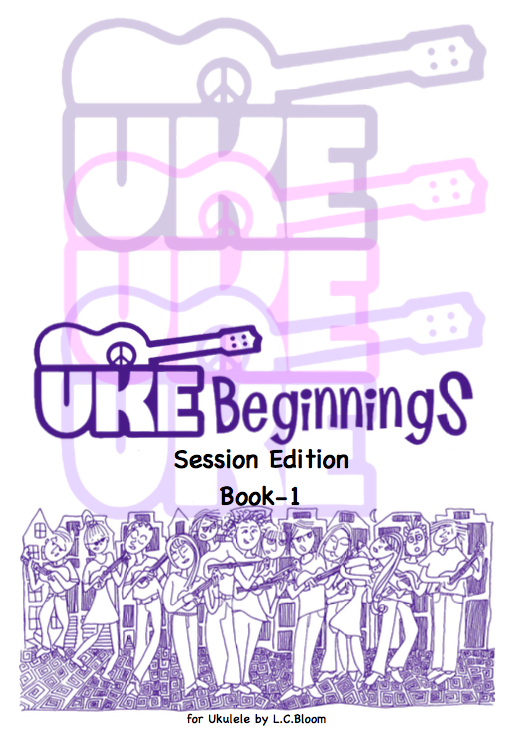 If enrolled as an absolute beginner in our “Uke Beginnings” package, you will to learn to play at least 3 chords, at least 3 songs, & 3 chord progressions in a matter of 1-3 days. Already playing? ‘Next level’ Ukulele Orchestra Academy Retreat package focus on improvisation, reading skills, arts masterclasses, ensemble playing and performance. So now, what a great way to spend a part of your Amsterdam holiday. First time beginners come learn some basics with our exclusive ‘Ukulele Beginnings Package’. Players come pick up or share a new trick or two, or just come Wednesdays with the UCA while here on vacation or on tour. We have groovy packages happenings at the the Boutique,six days week, year round with day and evening sessions to suit all UkeStyles. Masterclass Artists / Musicians planning to visit Amsterdam? For those that already live, plan to be on holiday, or are on tour in in Amsterdam and wish to visit The Uke Boutique. You are invited to give a masterclass, sell your Book and / or CD or possibly just perform. The Ukulele School of Amsterdam is located at The UkeBoutique, Lijnbaansgracht 191, and is central to many must see attractions and next door to a cool Cafe’ on the coolest Canal in Amsterdam. Contact me please at least 90 days in advance to set something up. email: candace@ukeboutique.nl for more details about giving a workshop, a performance, or maybe both. Where are all the Groovy Happenings? or onsite at ’Outreach Events’ in the Amsterdam area. 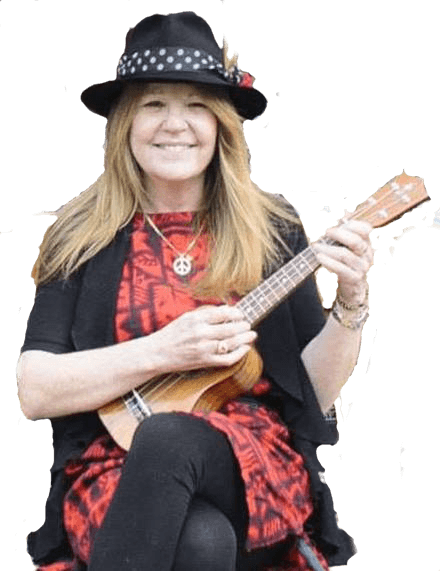 Come meet Crazy Orphelia, our resident visual artist, and ukulele instructor aka Candace Bloom who teach daily, both Beginner and intermediate level sessions, Tuesday Visiting Artists workshops, UkeShops & a weekly Ukulele Club of Amsterdam ‘JAM’ held at at the Uke Boutique. Crazy Orphelia’s Social Club Players Only Jam Tuesdays and Thursdays. Every Tuesday and Thursday: for Beginners 7:00 – 8:00 PM and for Next Level 8:00 – 9:00 PM. 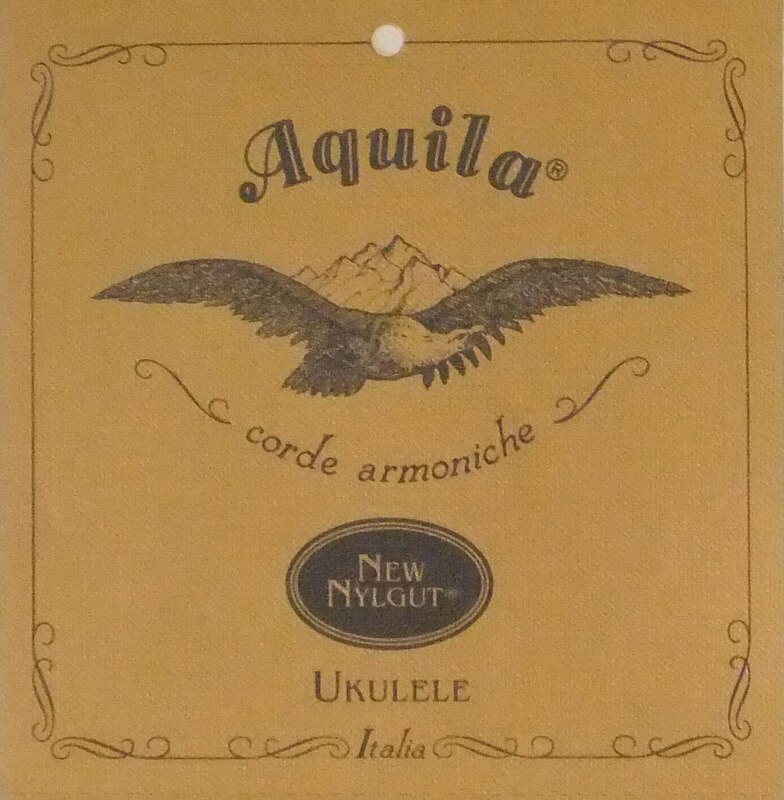 By buying a Ukulele Club of Amsterdam clubcard you’ll get 10 sessions for FREE, & please RSVP at ukuleleclub.org. 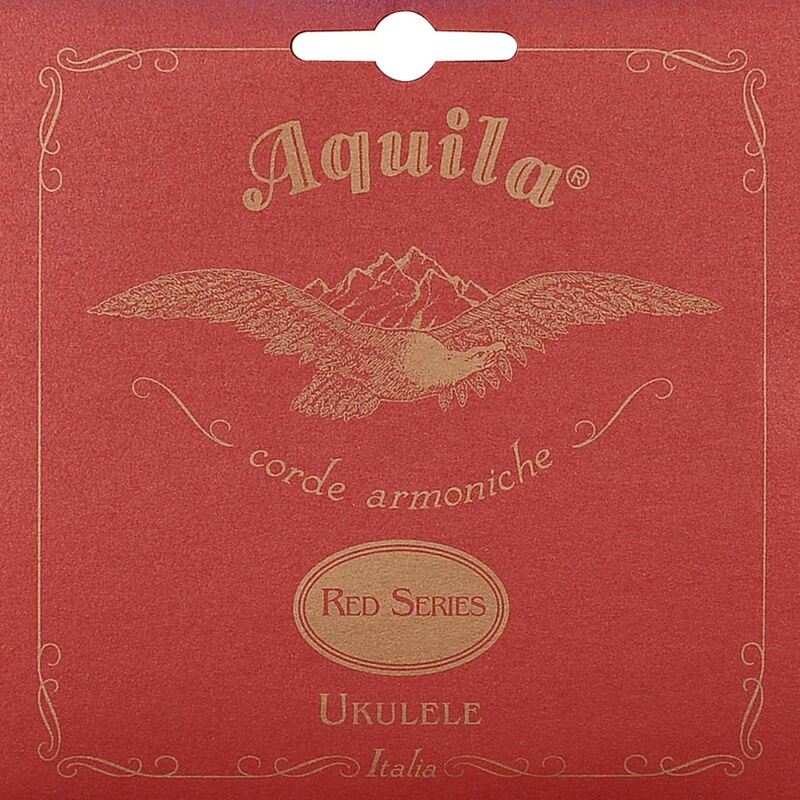 A discount of all purchases in the UkeBoutique of €10 per purchase (above €50). €135 for a lifetime membership. 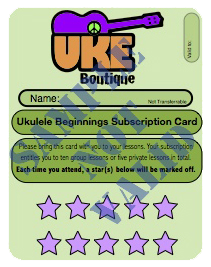 By your club card now at the UkeBoutique. Pre-paid with non refundable deposit €40. (€60) TWO-HOUR) mininimum 4 persons next level. This is Great Corporate Team Building or Visiting UkeClub event! We welcome locals & international hometown ukulele clubs, corporate team building groups, & small parties at the Boutique with a special rate for a onetime one or two hour beginning or intermediate UkeShop for a (min 24- 25 ) players. Starting at €30 per person, includes use of a ukulele and sheet music program book. 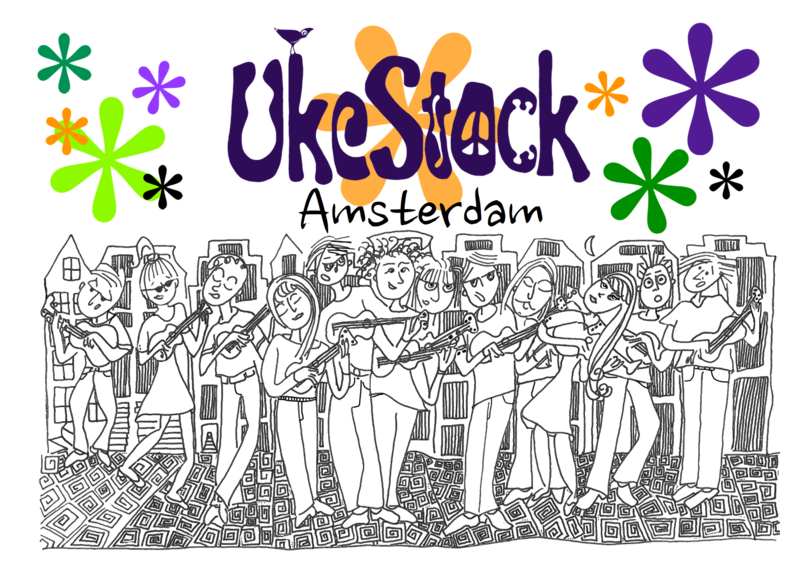 So bring your friends or colleagues or plan for your hometown traveling ukulele club to enjoy the daily UkeStock Lifestyle Retreat activities and everything else Amsterdam has to offer. We can always accommodate larger groups at alternative locations or onsite for corporate clients upon request. Willing to travel internationally with this UkeStock program to your club meeting or festival. Contact Candace@ukeboutique.nl for specific booking information. 2. Complete Ukestock Retreat Companion, sheetmusic guide. Priority reservations for visiting Artists Masterclasses.